Everywhere you look, there’s an Elvis. There one by the concession stand, checking his text messages. There’s another on the street, waiting for a cab to the airport. There’s one practicing his “Hound Dog” howl while looking at his reflection in a picture frame. Onstage, another Elvis swivels his hips in front of the audience at El Segundo’s Old Town Music Hall, the pink and faux crystal adorned home to last week’s Elvis impersonator contest and concert. Presented by the scrappy and promising art-world upstart the El Segundo Museum of Art, the event brought together international Elvises and local lip-curlers to perform the King’s hits. The entire spectrum of Elvis nation was represented. The young Presley was most convincingly portray by Jacob Roman, a 17-year-old who won the title “Elvis of El Segundo” during an earlier dance-off contested. Roman had ditched school to compete, but his hard work paid off, as he spun, sweated, and serenaded the Music Hall’s crowd. The main event was an Irish Elvis who depicted the icon in his later years (read: the fried peanut butter sandwich era) pretty well. While one Elvis performed, the others waited in the lobby critiquing the onstage performance. “He’s alright, I guuuuuuess,” a Vegas-era Elvis said, unintentionally segueing into the bassy crooner’s tone. While many of the Elvii looked more like Morrissey or Bruce Campbell in Evil Dead, the event posed a crucial question: Why Elvis? What was it about this white dude who appropriated Black blues that endures today? Is it his voice? Is it the moves? The hair? Perhaps, the participatory nature of his persona is what makes him endure. With each lip snarl, windmill arm spin, or quavering bellow, there’s an urge that seems to compel fans to try it themselves. No matter where you’re from, whether it’s Ireland or Thailand, you have a shot at creating your own version of Elvis. He’s America’s common denominator, a throughline for popular music, one of our first bona fide rock stars. Fifty years from now, will future generations perform Tupac or Kurt Cobain imitations? Will Nicki Minaj conventions sell out airport-adjacent Ramada Inns? Probably not. 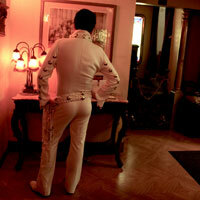 But Elvis impersonators will still be gyrating and strutting–beer guts, mutton chops, and all.